And since this statement is usually followed by (“And by the way… I have no money for gifts, Mom”), I encourage them to find simple handmade gift ideas that are perfect as homemade Christmas gifts. Here’s a list of 25 easy DIY Christmas gifts that are easy for kids to make! P.S. Check out this post for simple Christmas ornaments kids can make. Teaching kids to make gifts for their loved ones is a wonderful way to teach them about the Christmas spirit of giving! P.S. 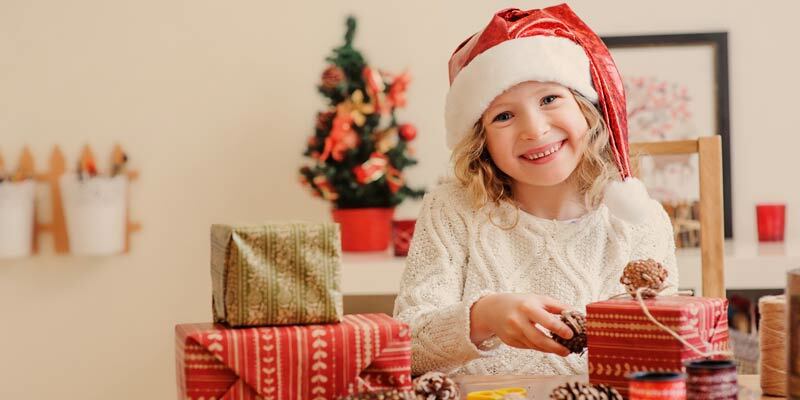 Speaking of teaching kids about giving, doing Christmas-themed Acts of Kindness with kids is a wonderful way for kids to really put their faith in action! You’ve got to check out this post (with a video) on how to make Christmas Acts of Kindness easy, simple and fun with the resources from the Christ-Centered Christmas Family Traditions System! 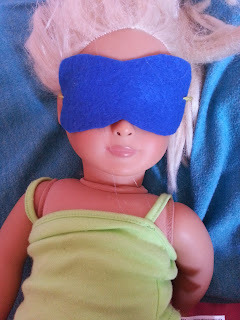 1) Here’s a cute gift for that American Girl Doll lover: a homemade doll sleep mask. And dare I say it’s one American Girl accessory that won’t cost a pretty penny? 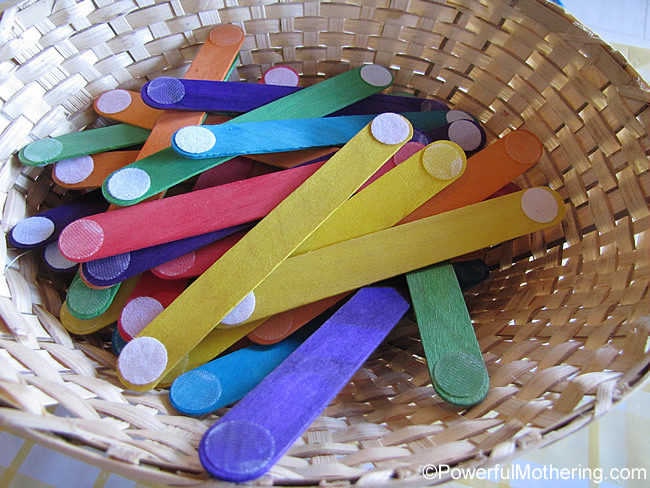 2) These Velcro Dot Craft Sticks are incredibly easy to make, but would be a great gift for a toddler or preschooler. 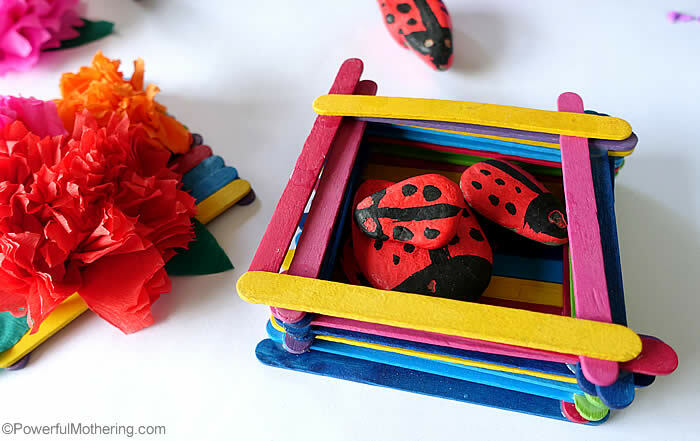 These are do-it-yourself building materials to keep little hands busy! 3) And oh… how adorable these DIY Baby Fabric Bows from Craftaholics Anonymous are! Admittedly the gift receiver (a infant) would probably not recognize the sheer cuteness of these, but they are an easy gift to make nonetheless for an excited big sister or cousin. 4) Speaking of popsicle sticks… how about creating a kids’ treasure box? Your child could paint it (as shown here in this post from Powerful Mothering) or add stickers or silk flowers for additional personalization. 5) Do you have a budding artist in your home? How about this super cute Kids Travel Art Kit from A Whimsicle Life made out of a CD case?! True, this gift would take the work of an older child to create, but what a fun gift for a younger sibling that loves art! 6) My oldest son made one of these A-Frame Pup Tents last year for our toddler and it was a hit! Check out this simple and fun gift idea from Lindsay & Drew here. 7) Do your kids like “slime”? Let me rephrase that… do they like to play with icky, oozy, stretchy stuff? Learning Through Playing not only shares her recipe for “slime” here, but a really fun way to give it as a gift (yes, evidently it’s possible to “gift” slime). Check out her Slime Ornaments here! What little boy wouldn’t want this?! 8) Alright, this would probably take some adult supervision, but come on… what little girl wouldn’t love her big brother forever after receiving this gift: a custom made dollhouse. Sutton Grace has a tutorial here (including plans) for a wood dollhouse… but I’m wondering (just to make things a little simpler) if a slightly-less-sturdy version could be made out of cardboard? 9) Lastly, you’ve gotta love these homemade bows and arrows out of PVC Pipe from Skip to My Lou. My kids would have a field day shooting each other with these all over our yard! 10) Whoa! Look at these adorable DIY Sharpie Mugs! 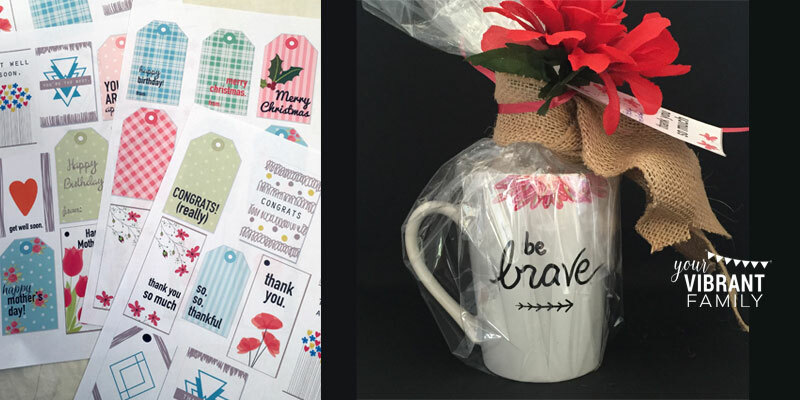 I’ve got a step-by-step tutorial (plus free all-season gift tags!) that you can check out in this post! My kids made these as a classroom project one year for all the teachers at their school! Kids love making these and adults love getting them! 11) Here’s a twist on the traditional candle gift: decorating votive candles with a design on the outside. The post here from Buggy and Buddy is in reference to Valentine’s Day, but it can be adapted to be a general design or a seasonal one. 12) Homemade beauty products are an easy and inexpensive gift. Teaching 2 and 3 Year Olds shares her recipe for Lavender Bath Salts. 13) Or how about an awesome homemade body scrub? Simply mix about 1 cup of white sugar with 1/2 organic coconut oil and then add about 6 drops of your favorite essential oils. Some great combos would be lavender and peppermint; or a lemon and tangerine blend. 14) Bath bombs are… well… the bomb! My kids love giving them (and this momma loves receiving them). Check out Red Ted Art’s recipe and cute heart-shaped bath bombs here. 15) Here’s a sentimental gift that can be added to each year: A drawing journal that a child creates and gives to a loved one. Sunshine and Hurricanes details her idea here. 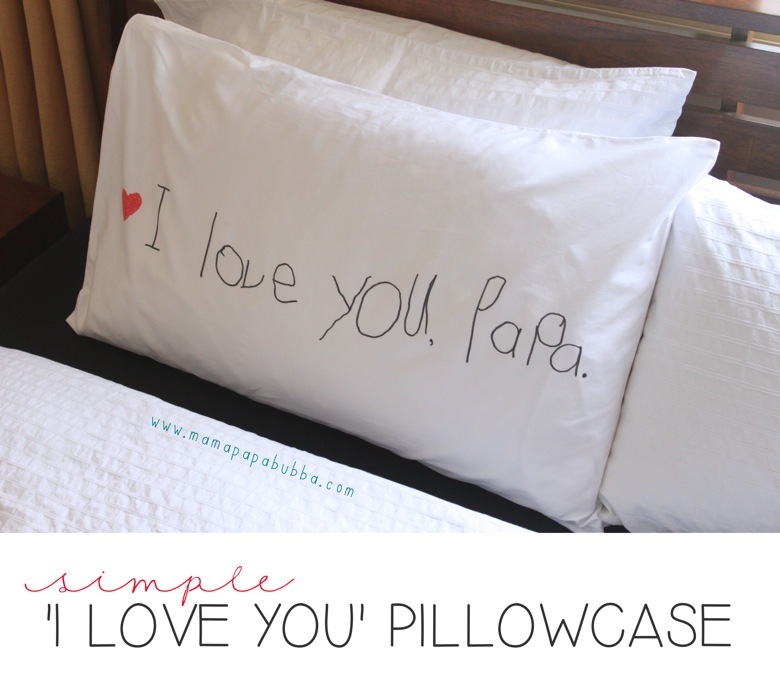 16) Speaking of sentimental gifts, this “I Love You” Pillowcase is adorable! How precious would this be?! You can see Mama Papa Bubba’s tutorial here. 17) Here’s a practical (yet fun!) gift: DIY Mini Pallet Coasters! These are coasters (made from craft sticks) designed to look like little pallets. Boxy Colonial also shares a cute coaster idea here. 18) Check out these fun Flavorful Spoons that are perfect for coffee lovers or anyone who enjoys a hot drink (with a little sweetness added). The directions here are a little more make-it-and-serve-it-now, but the principle remains the same if you were to wrap up the spoons in little clear gifts bags like these and tie a ribbon at the top. These would be great gifts for a coach, teacher, etc! 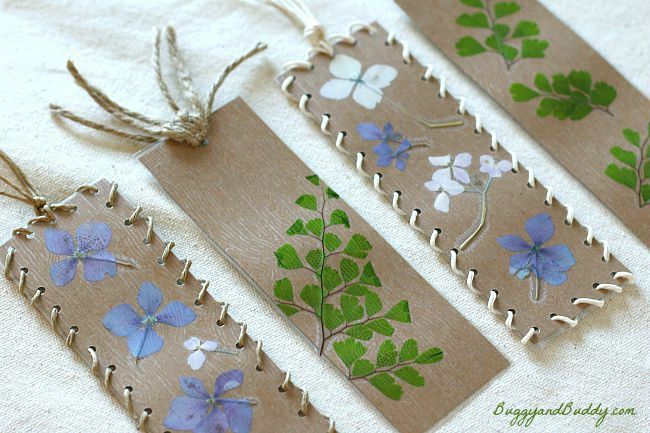 19) What about these adorable Pressed Flowers and Leaves Bookmarks from Buggy and Buddy? I love the string woven on the edges of these. And it’s a simple craft that even the youngest kids can do. Or this fun bookmark craft from Little Log Cottage School uses photos as the bookmark itself! Super fun. 20) Or how about a DIY Coffee Mug? The Realistic Mama has links here to 10 DIY Mug designs. She also has some good tips on how to prepare and seal your mug once it’s gone through its artful transformation. 21) And if you’re making custom coffee mugs, why not have your kids create some uniquely-blended tea bags? Nellie Bellie shares an insanely genius idea here of using coffee filters to create your own tea bags. Wouldn’t these be cute if the kids created little designs on the tags?! 22) These oven-bake clay necklaces from P is for Preschooler are cute too! And it looks like you could make quite a few necklace charms at a time (which is helpful when you have several children who need to make gifts). Play to Learn Preschool has another idea here that uses Crayola Model Magic and dimes. 23) Edible gifts are an easy favorite. What about helping your child whip up some cookies or other tasty treats like Apple Green Cottage shares about here? You can also check out this Christmas baking post from the site (it shares 10 Ways that Christmas cookie baking can be a teaching opportunity)! 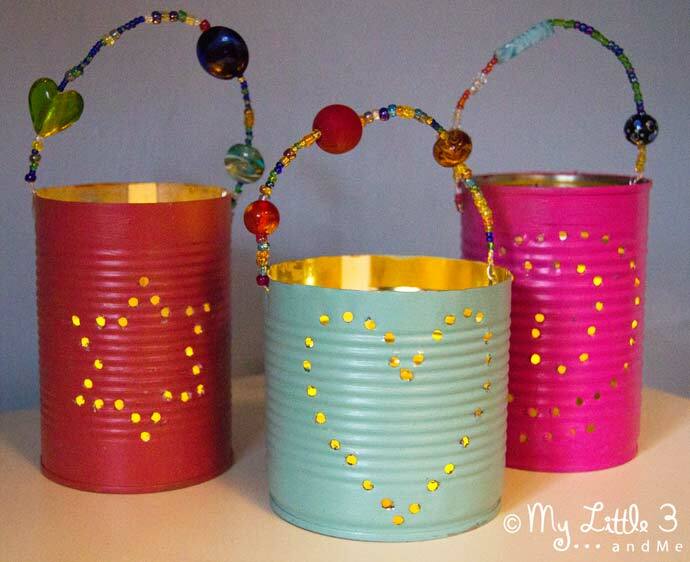 24) What about a fun Tin Can Lantern? These would be adorable displayed on a porch or a windowsill. And there’s super easy to make. Kids Craft Room shares her tutorial here. 25) Mmmm… is there anything better than a cuddly warm blanket? 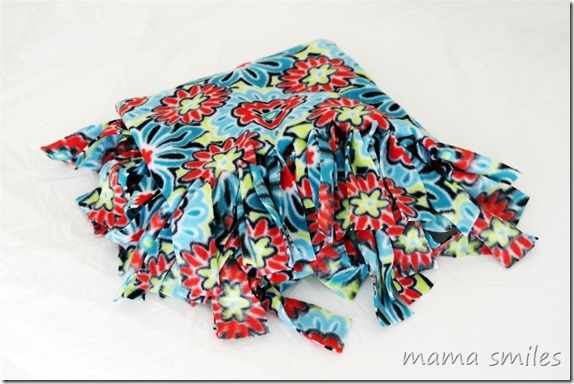 Your kids can make one (without sewing) with this Easy No-Sew Blanket Tutorial from Mama Smiles. The best part about these blankets is that they can be made any size. Along with blankets made to be twin-bed-size, think couch-throw-size, crib-size, doll-size… you name it. 26) OK, confession time: I want someone to make one of these rugs for me. Any volunteers? Pretty please? Alright, maybe I’ll have to hint around with my kids on this. But seriously, you’ve got to check out this ah-dorable rag rug from Craftaholics Anonymous. What fun this could be! And if you’re interested in experiencing a Christmas that focuses on the true story of Jesus’ birth, you’ve got to check out the Christ-Centered Christmas Family Traditions System!